We know what fun it is to be outside! But we're also serious about your fun. 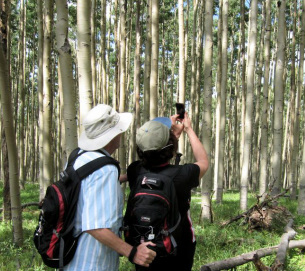 As a professional guide service, Outspire is recognized and approved for leading guests into the outdoors of Santa Fe National Forest, Bandelier National Monument and other public lands by permit. Every guide has emergency medical and specialized outdoor training. This helps you know your safety is protected and your enjoyment is ensured while at the same time we follow practices outlined to protect the beautiful places we visit. Outspire is a partner in the community, supporting the efforts of the Trails Alliance of Santa Fe, the Santa Fe Conservation Trust, and many other worthy community groups. Outspire and its guides have contributed in a variety of ways to our local community for years, particularly as regards our natural resources. Although our guides are peppy and enthusiastic to share their joy of the outdoors with you, they're not young pups. All are well-seasoned outdoor folks with lots of life experience to bring to the party. We have been living in New Mexico for years and love it! Scott Renbarger hiking guide and owner of Outspire Hiking and Snowshoeing, has been living and hiking in Santa Fe since 1996. 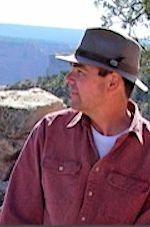 Scott has a background in the geological sciences and he teaches Physical and Historical Geology at Santa Fe Community College. Scott is delighted to share his enthusiasm for the natural and cultural history of northern New Mexico with anyone who likes to get outside. Brian Johnson is an outdoor adventure trip leader and certified Wilderness First Responder, with over 40 years of backpacking experience. He has led outings for Ghost Ranch Education & Retreat Center, Santa Fe Community College, and Sierra Club National Outings. Living in Santa Fe since 1989, Brian served the State of New Mexico in environmental protection efforts, working in clean energy and mine reclamation programs. Now Owner & Chief Guide of Less Traveled Trails, LLC, his more recent outdoor adventures have emphasized friends & family backpacking, snowshoe/skiing overnight trips, and finding secluded camping spots in beautiful high country settings. Outspire offers custom workshops, private lessons, or outdoor-themed events for your group. Workshops are customized to your needs and interests. Listed here are examples that can be scheduled for you. All equipment and take-home handouts supplied, and workshops include plenty of practical exercises. If you have questions or other topics of interest, please call or email! Wildflowers of Santa Fe An outing focusing on finding and learning about native flowering plants. Offered in season; we have a variety of life zones, so choose your area of special interest such as mountain or high desert. Geology of Northern New Mexico An outing focusing on aspects of our region's spectacular geological history. There are a variety of approaches we can consider depending on your area of interest. Introduction to Snowshoeing Although snowshoeing is not difficult, there are still "tricks" which can make your trips much more enjoyable. A structured introduction to snowshoe types, clothing, other equipment, and on- and off-trail techniques. Offered in season only. Equipment provided, or use your own. Introduction to Nature Journaling This offering is in development, with the intention of introducing some basic techniques of drawing and journaling in an outdoor setting.